For a cruise experience unlike any other, combine luxury and adventure by sailing to the Galápagos Islands with Silversea Expeditions. Silversea offers expedition cruising to all seven continents, allowing you access to some of the most remote and exotic places in the world like the Galápagos Islands, one of the most secluded and sought-after destinations on the planet. Anyone who loves wildlife and wants to walk in Darwin’s footsteps while cruising in all-inclusive elegance will be blown away with a Silversea cruise to this unspoiled region of the world. Quite simply, there's no better way to experience the Galápagos Islands than a voyage with Silversea. The Galápagos Islands is one of the world's most famous and pristine natural laboratories. What Makes the Galápagos So Enchanting? While only a short plane ride from mainland Ecuador, the region is a world all its own. The islands and surroundings waters offer visitors up-close encounters with exotic animals who have no fear of humans, allowing for vivid memories and magazine-worthy photos. These wildlife sightings coupled with a favorable climate (temperatures hover in the 70s and 80s) make the Galápagos Islands a premier ecotourism destination any time of the year. Lying just off the western coast of South America, the islands were uninhabited and unknown until the late 16th century. To this day, the Galápagos archipelago is inaccessible to most, yet this isolation has allowed nature to develop in ways exclusive to the islands. Insider Tip: Experience it all with Silversea's complimentary exploration activities including Zodiac tours, snorkeling, kayaking and nature hikes led by highly experienced guides certified by the National Park of the Galápagos. Every Silversea Expedition to the Galápagos offers the chance to get up-close-and-personal with the region's unique ecosystem. From snorkeling with sea lions, photographing the famous Blue-footed Booby and hiking along lava tunnels and back to the beginning of time, Silversea's Galapagos cruise ships take you to the remote islands, whilst indulging you in the unrivaled all-suite comfort and elegant sophistication which makes Silversea famous. 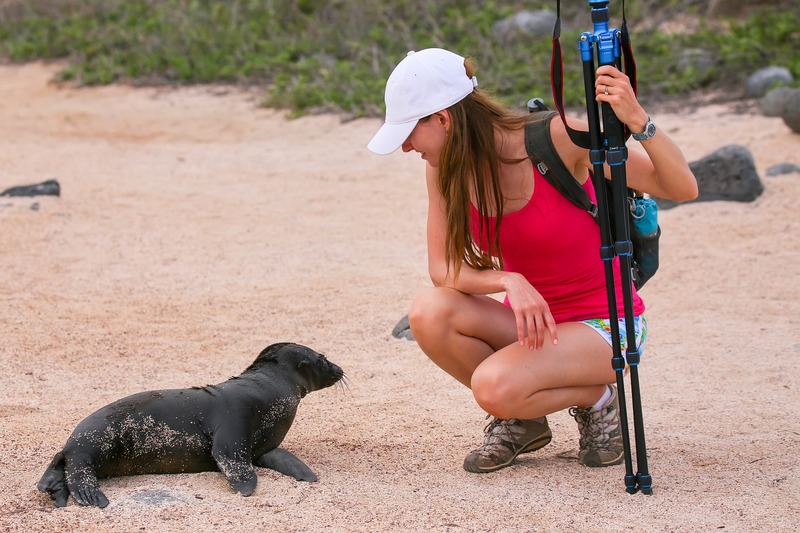 The isolated and iconic blue waters of the Galápagos offer opportunities to interact with wildlife. Watch bellowing elephant bulls challenge each other in a spectacular display. Step over iguanas basking in the sun. Enjoy the ancient giant tortoises from steps away. It is not only the abundance of wildlife, but their fearlessness that makes the Galápagos island cruise a nature lover’s dream. 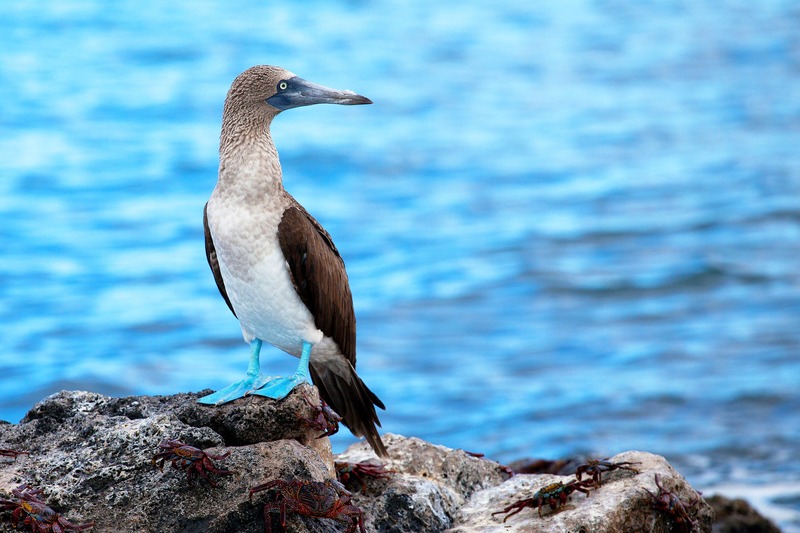 Insider Tip: Blue-footed Boobies are aptly named, and males take great pride in their fabulous feet. During mating rituals, male birds show off their feet to prospective mates with a high-stepping strut. The bluer the feet, the more attractive the mate. Charles Darwin arrived in 1835 and spent weeks studying the wildlife on four of the islands. Many species, primarily the finches, served as the inspiration for Darwin’s theory of evolution by natural selection. The islands are home to at least 13 distinct species of finches that have evolved from a single species and adapted their diets to the unique ecosystems of individual islands. The endangered Mangrove Finch lives exclusively on Isabela Island. Researchers estimate there are fewer than 100 in existence between two mangroves. The charismatic Blue-footed boobies are one of the world's most famous birds. Thousands of giant tortoises reigned long before the islands became a hideout for pirates and a rest stop for whalers. The whalers created a postal exchange by dropping letters in a wooden barrel on Floreana Island. Vessels on their way home would stop and pick up any correspondence meant for their destination and deliver it by hand upon their arrival. Insider Tip: The centuries-old mariner's "mail" tradition continues today, as tourists employ a leave one, take one system—no postage necessary. You’ll have plenty to write home about after snorkeling in the clear blue waters off this island’s coast. 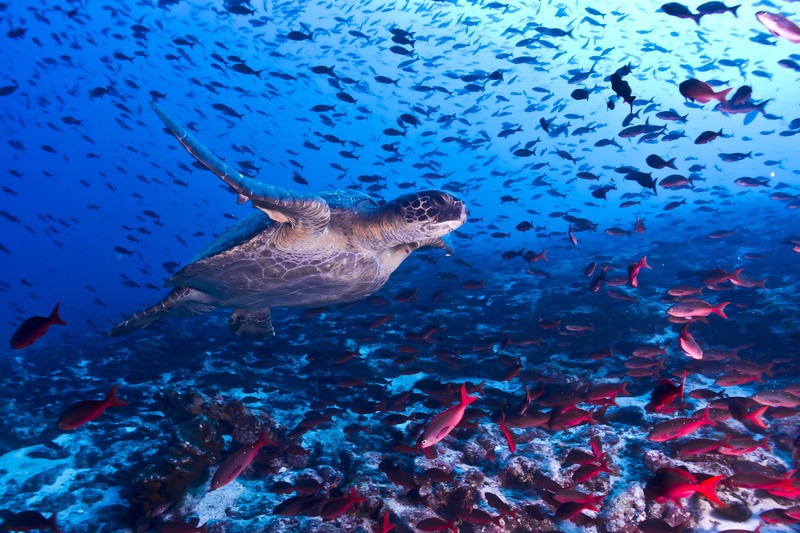 The Galápagos Islands are often referred to as a living museum, and rightly so. 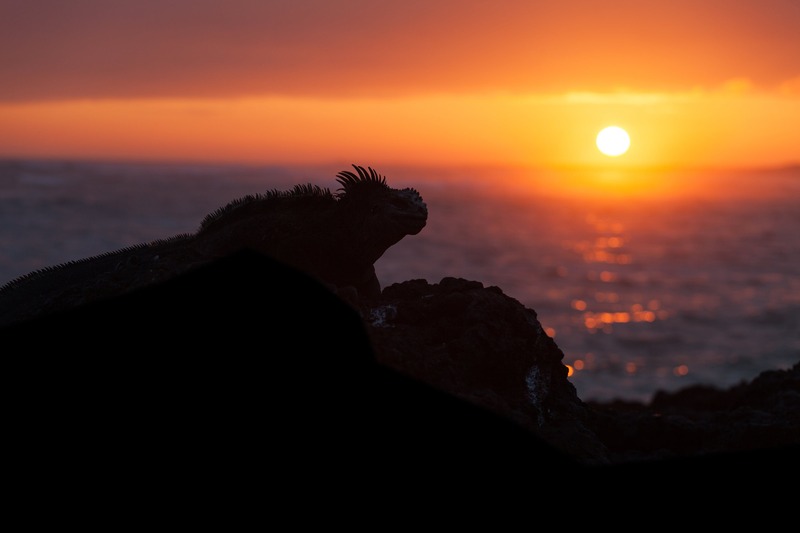 By visiting just a few of the islands, you'll come face-to-face with a myriad of unique animals: marine iguanas lounging on rocky shores, multicolored Sally Lightfoot crabs skittering along the sand, blue-footed boobies performing a delicate dance to attract a mate, or even sea lions playing on a pier. The giant tortoises of the Galápagos are among the longest-lived of all vertebrates. Because the islands are so secluded, a number of these endemic animals such as the Galápagos penguin, the waved albatross, the flightless cormorant, the Galápagos fur seal, and the Galápagos Hawk cannot be seen anywhere else in the world. Insider Tip: The giant tortoises of the Galápagos are among the longest-lived of all vertebrates, averaging over 100 years old. At the Charles Darwin Research Institute on Santa Cruz Island, you can tour the grounds and see both hatchlings and adult tortoises. Darwin’s influence remains salient: today, researchers and volunteers work on the archipelago to preserve the native species and educate visitors on conservation efforts and obstacles like non-indigenous animals. A number of the species native to the islands do not exist elsewhere, so maintaining the population of these rare animals is paramount. At the center of the archipelago, Santa Cruz Island serves as the main tourism hub. In addition to learning about Darwin’s work, you'll be able to linger in cafés and browse shops in Puerto Ayora or lounge on picturesque beaches and watch flamingos and sea turtles. Enjoy the isolated and incredible diversity of the region's plant and animal species, many found nowhere else. The diversity of wildlife here is unparalleled, both on land and in the water. Marine life presents a diver’s dream, with over 40 endemic fish species, hammerhead sharks, Galápagos black coral, sea turtles, and many more creatures. It is easy to understand why the Galápagos Islands were one of the first locations recognized on the UNESCO World Heritage List in 1978. The Ecuadorian government has designated 97% of the land as national park in an effort to preserve the exotic ecosystems that exist nowhere else. Insider Tip: Using Silversea’s Zodiac fleet, you'll be able to visit several of the uninhabited islands, including Fernandina, home of the most active of the Galápagos volcanos, and Santiago, which offers seven dive sites. 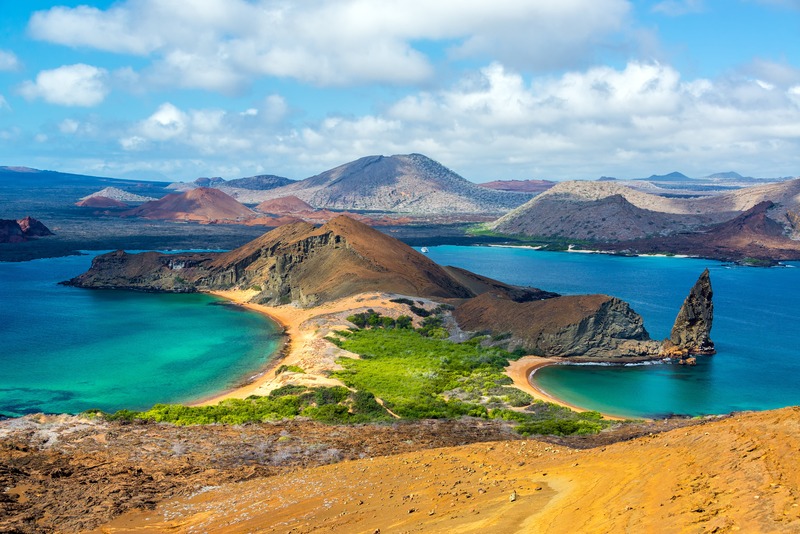 Why Experience the Galápagos with Silversea? Silversea offers a variety of 7-day cruises all year long on the Silver Galápagos, a recently refurbished ship that accommodates 100 guests and features a piano bar, Jacuzzi, fitness center, and massage parlor. Enjoy all the amenities Silversea is known for: butler service, fine dining, room service, free Wi-Fi, transfer flights, and Zodiac excursions. The expedition team on board includes experts such as biologists, ornithologists, and historians who can complete your experience with lectures and discussion in a way no guide book can. A Galápagos expedition cruise brings you to one of the most isolated places in the world allowing you to encounter an abundant variety of wildlife species that is so incredibly unique, it is found nowhere else on earth. The expedition team on board includes experts such as biologists, ornithologists, and historians who can complete your experience with lectures and discussion in a way no guide book can. Interact with wildlife like never before on a Silversea Expedition. Every luxurious Galápagos expedition cruise with Silversea will immerse you in one of the most isolated places in the world to encounter an abundant variety of wildlife species that is incredibly unique and found nowhere else on earth. By choosing Silversea, you are guaranteed the best of both worlds—luxury and adventure—spending your days exploring some of the most pristine terrain and waters on earth, and nights sipping martinis in the piano bar or tucked into a chic luxury suite with all the appointments and amenities you can imagine. Search Silversea’s all-inclusive luxury sailings to the Galápagos Islands or speak to a CruiseInsider today at 1 (877) 734-6858.